Red, Bike, & Green: The Interview! The link between transportation and racial justice has been an explicit part of American culture since Rosa Parks ignited the Montgomery Bus Boycot in 1955, if not earlier. Most of us understand, if only intuitively, that who moves around, where they move to and from, and what they move upon interacts with complicated histories of oppression, rebellion, and innovation. 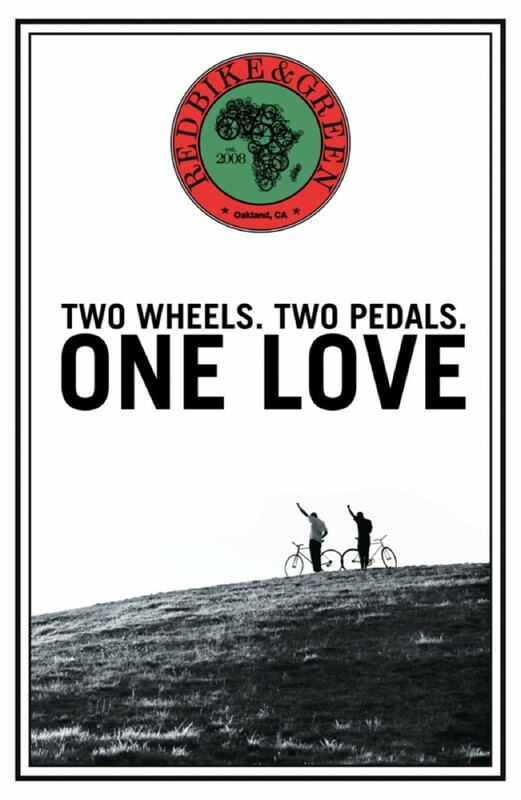 This is one of the reasons why Oakland’s Red, Bike, and Green collective is so exciting. 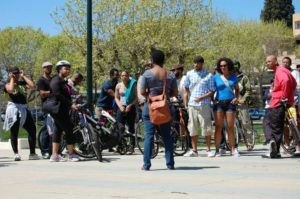 They have not only created an an affirmative, welcome spacing for Black urban cyclists but also established a platform for a new discussion of the politics of mobility in the city. I recently had a chance to ask Red, Bike, and Green about their work and views. The following is a transcript of our exchange. Q. Can you tell me how Red, Bike, and Green (RBG) got started and what exactly you do? A. Five years ago, becoming more and more disenchanted with driving, the cost of regular car maintenance, insurance rates, gas prices, and the overall expense of having a car, Jenna Burton decided to ride her bike more regularly. She began to think about creating a space and culture for Black folks that would promote biking as a safe and viable mode of transportation. Burton organized a small group of Black bikers to go on random weekend rides. Further conversations with colleagues and friends led to naming the group Red, Bike, and Green. For those unfamiliar, Red, Bike and Green is an ode to Marcus Garvey’s idea that Black people in the United States need their own nation and flag, which would be symbolized in the colors of Red, Black, and Green. With a little help from some friends, Burton officially launched the first season in April of 2010. Red, Bike, and Green now rides every third Saturday and First Friday of the month from April until November of each year. Q. One way that White supremacy operates is by limiting the mobility of Black people and people of color generally—from the laws that prevented people from moving into a specific neighborhood to the ongoing police harassment of motorists (i.e., “driving while Black”). Do you believe that encouraging Black people to get around by bike is a way to challenge White supremacy? If so, how? A. Yes. And no. First and foremost, we see RBG as a psychological and spiritual departure from White-supremacist values. While we are not gathering with the intention of directly challenging White supremacy, we are not trying to feed that machine either. If the indirect outcome of being pro Black (not anti-White) and asserting autonomy is a challenge to White supremacy, then so be it. We are functioning out of a love for Black people and the need to create a space where we feel safe and part of a community that cares about our well-being. When you see fifty plus Black people on bikes in ANY neighborhood it is a symbol of Black power. The rides are a way to make a space where Black love and healthy Black living is visible. As a result of RBG’s success in outreaching to a community of Black folks who have largely been ignored by mainstream bike culture, it has given us a platform with which to fight different sorts of oppression and we are grateful for that. Q. Black people have long been marginalized in the cycling sports—from the prohibition on African-American membership in the League of American Bicyclists, which was not rescinded until 1999, to more subtle signals that push Black people out of bike networks. 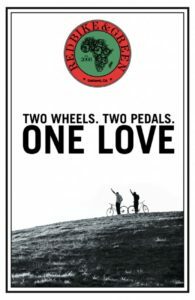 What do you think about the racial dynamics of the bike scene in the East Bay today? In what ways is it an affirmative, inviting place for Black people and how is it not? What is affirming is that there are groups that have advocated for bike lanes in some neighborhoods, which make it safer and easier to ride for all bikers. Who are the bike lanes for is the question. It is easy to assume that biking is a really accessible and easy way to travel. But a simple understanding like that discounts not only the cost of the bike but also other factors that weigh in when thinking about riding. Can you afford to fix your bike if it is broken? Is it practical for your lifestyle (i.e., do you have children)? If your bike is stolen, can you replace it? What’s the morale before even deciding to get on a bike? If we were to use a metaphor to illustrate the racial dynamics of the bike scene in the East Bay, it might read something like this: Red, Bike, and Green is like English Breakfast Tea being dropped in an ocean—it’s not going to turn anything Black. The bike scene in the East Bay is largely a White space and since Black people are traditionally overlooked in bike culture as well as multi-racial sites of organizing, an organization like RBG fills a void. Q. There is a tendency in Hip Hop culture to celebrate cars, particularly luxury cars, as symbols of power and even defiance. Do you believe that encouraging bike riding among Black people is an important counter-tendency to this trend? If so, why? A. RBG is cultivating a culture of healthy living that incorporates more alternative and economic modes of transportation, such as bike riding. It’s important to encourage bike riding as a counter tendency to materialism, but we want to be careful not to give Hip Hop (or any one culture) the monopoly on defining blackness. The side that’s been dominated by mainstream media has fixated on a particular kind of Hip Hop, where luxury cars are flaunted as being Hip Hop. As an anecdote, when Burton started riding her bike in 2008, the Black folks that she would see riding were largely folks that couldn’t afford cars. By and large, they rode a bike out of necessity. And over the years she has seen a change. 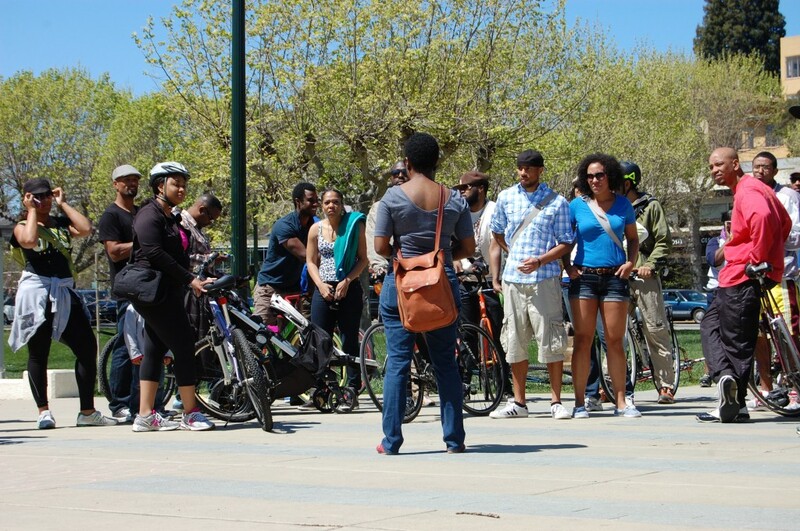 While it is still not commonplace, there are a lot more Black folks on bikes. Part of the reason why RBG exists is to try and bridge the gap between the folks that are already riding (the avid cyclist; the sports enthusiast; the college educated, single, twenty/thirty something, without kids, health conscious rider) and those that haven’t given riding a second thought. And one thing RBG does pretty well is create a visual aesthetic around Black folks riding bikes, care of our designer, Nick James. The material that is produced for RBG intentionally uses the rich history of biking in the Black community. I guess you could say we are redefining Blackness too. Q. Do you have sister groups in other cities? Yes. In Chicago and Atlanta. Q. In an ideal world, where will Black biking in the Bay Area be in, say, five or ten years? A. Hopefully there will still be Black people left in Oakland and the Bay Area. Q. How can people get involved with and/or support RBG?